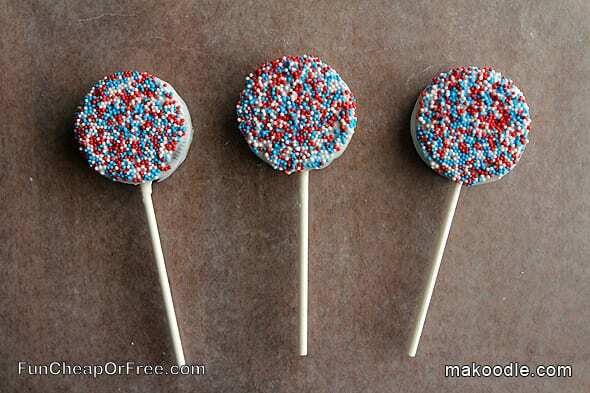 3 Ingredient Patriotic Oreo Pops - Perfect for 4th of July! I love 4th of July! It's a fun holiday jam-packed with BBQ's, friends, fireworks, and parties. I always ooooh and aaaaah over those gorgeous patriotic desserts I see on Pinterest, but I hate to bake and don't want to take the time to make them. 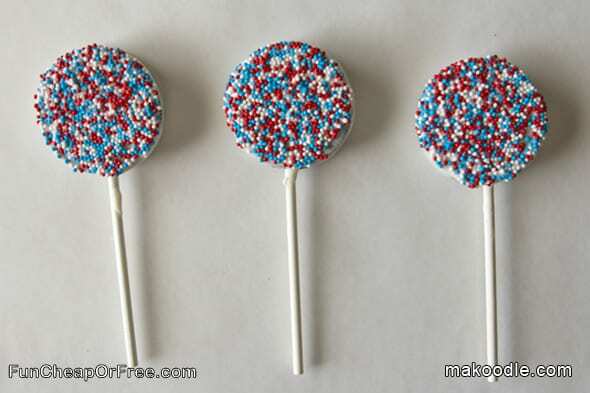 Lucky for us I discovered the cutest, easiest, and yummiest Patriotic Oreo Pops that are bound to be the hit of the BBQ! 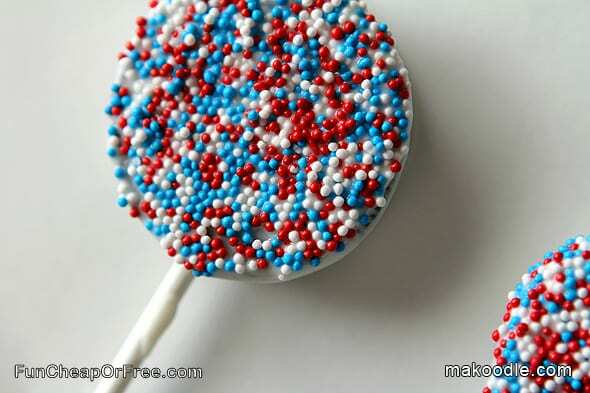 Camille over at Makoodle is the queen of parties, and a lover of holidays, so she's showing us her no fail, easy-peasy, 3-ingredient Patriotic Oreo Pop recipe and tutorial, just in time for the 4th of July! Take it away Camille! Hi there, Freebs! I'm Camille from Makoodle, and I am so excited to share my love of Oreo pops with you! Anything on a stick is cute, right? Add a few sprinkles and you’ve got yourself a win! 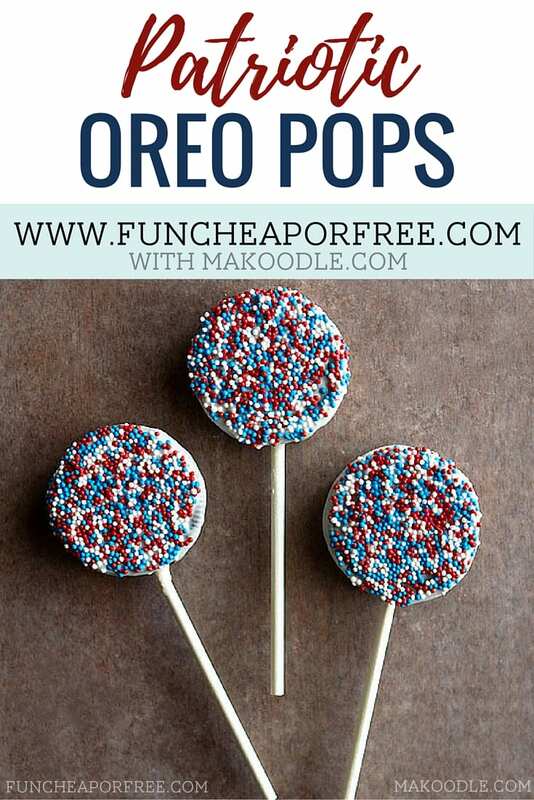 These treats are incredibly easy and are perfect treats for a Fourth of July BBQ or picnic; Oreo pops are always the hit of the party! Melt the chocolate in the microwave, then put the chocolate in your Velata warmer to keep it the right consistency. Pour the sprinkles on a plate. Don’t those sprinkles just make you happy! 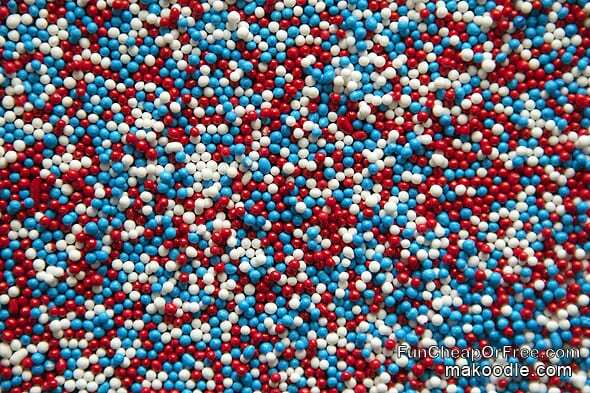 I love sprinkles. Especially nonpareil sprinkles. 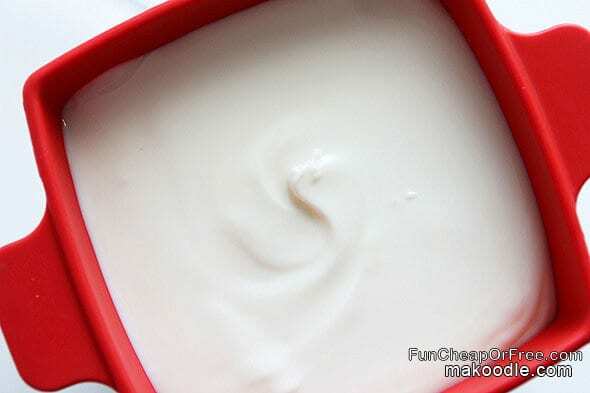 Remove one side of the Oreo cookie and place a sucker stick in the center of the cream filling. Put a small amount of melted chocolate in the cookie to help create a bond to the other cookie. 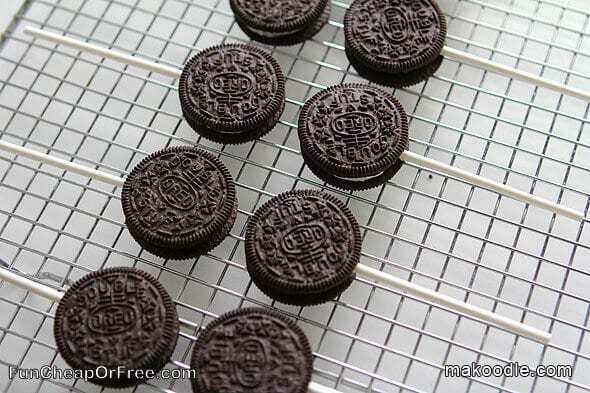 Place the other side Oreo cookie back on top of the cookie filling. 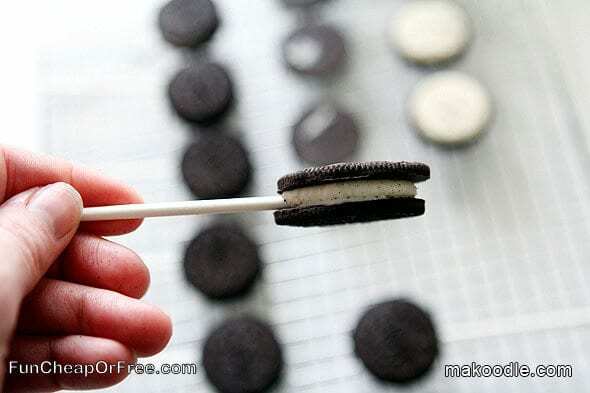 Let the Oreo cookie pops sit for several minutes to allow the chocolate to setup and create a bond. 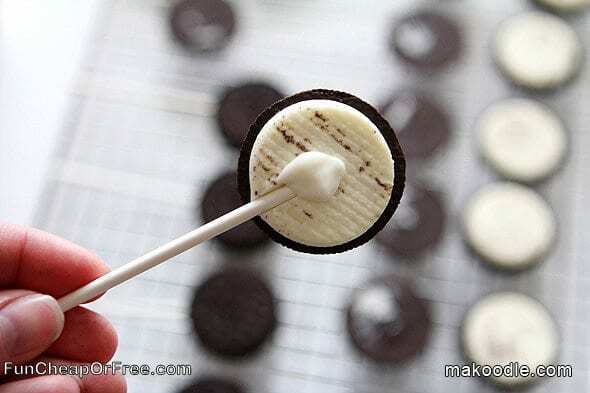 Another method for creating Oreo pops is to put the sucker stick in the middle of the cookie and place the Oreo cookies in the freezer and let the freezer create the bond by freezing the filling. 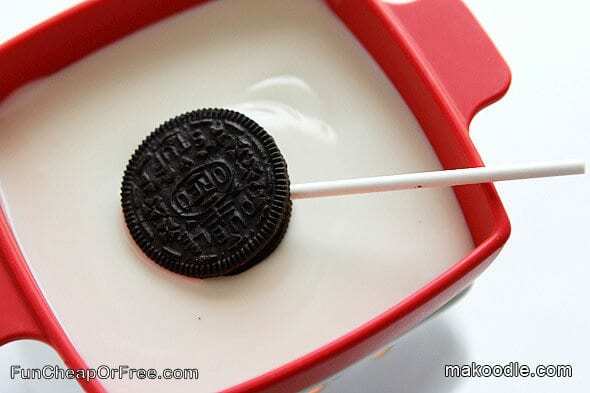 Dip the Oreo pop into the melted chocolate. Make sure to cover both sides so each side is completely covered, then tap off the excess chocolate. 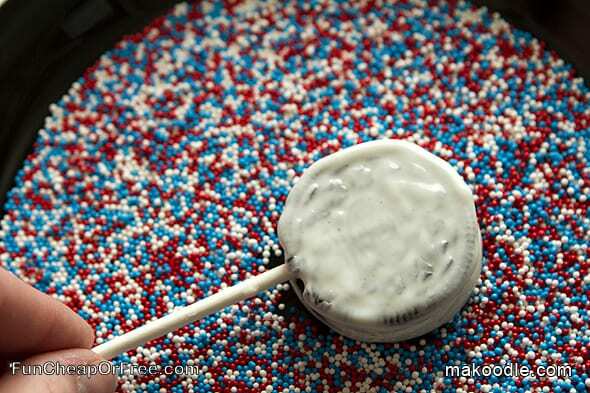 Place one side of the Oreo pop in the plate of sprinkles. 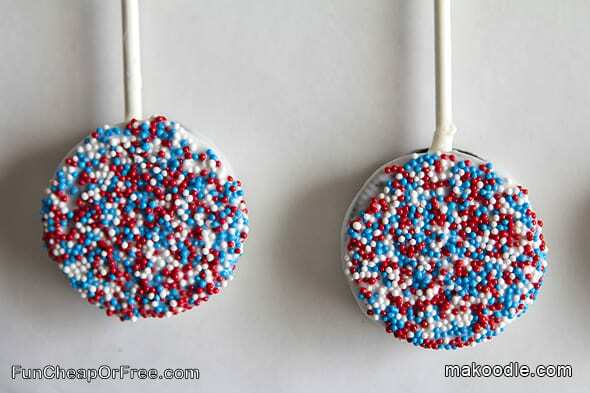 Place the sprinkled Oreo pop on wax paper and allow to setup for 20-30 minutes. That’s it! My kids loved helping make this cute, simple treat. You can make these several days in advance so they are ready for your party beforehand. I hope you have a wonderful 4th of July! If you like this idea, be sure to become a fan of Makoodle on Facebook, follow on Pinterest, and subscribe to our feed to stay up-to-date with Makoodle’s latest freebies and projects. See you soon! Thanks for the drool-inducing photos, Camille! Excuse me as I run to Walmart and buy all the Oreos! I will have to make these for our next big backyard BBQ – you could mix and match with any sprinkles, and use what you have on hand! GENIUS. (Which in my cause might be Christmas Trees… but it's the thought that counts, right?) Be sure to visit, and keep up with Camille over at Makoodle! What are your favorite 4th of July traditions? Share with me in the comments below!